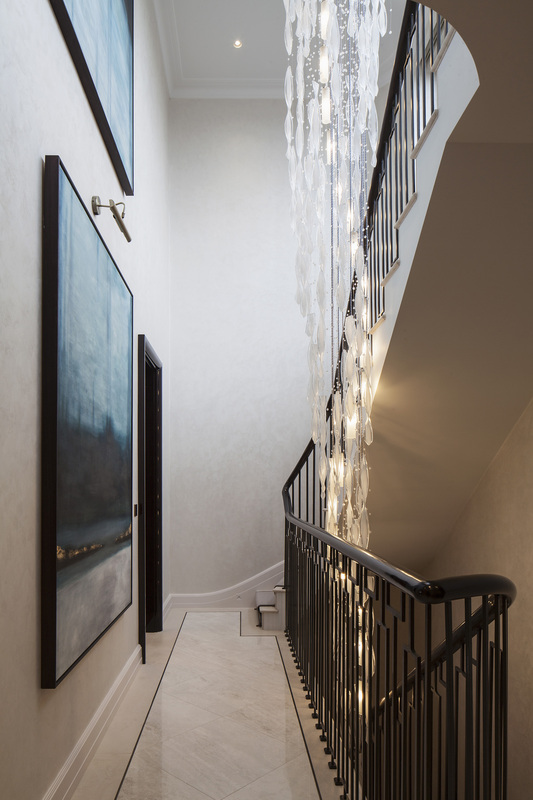 ‘We immensely enjoyed working on this residential project with its high spec and elegant design. 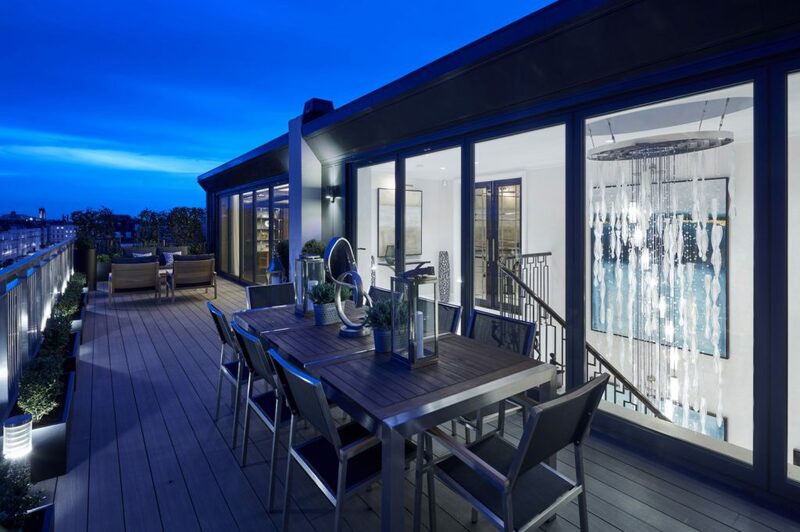 From designing a creative, beautiful and practical solution for a chandelier in the tall, thin stairwell, to overseeing the colour combinations of the glass pendants within the dining room, this was just the kind of project that the Nulty Bespoke team thrives upon. Throughout the design, manufacture and installation every detail was diligently considered – from the positioning of each individual element in the design stage to the threading and fastening of every tiny crystal’. 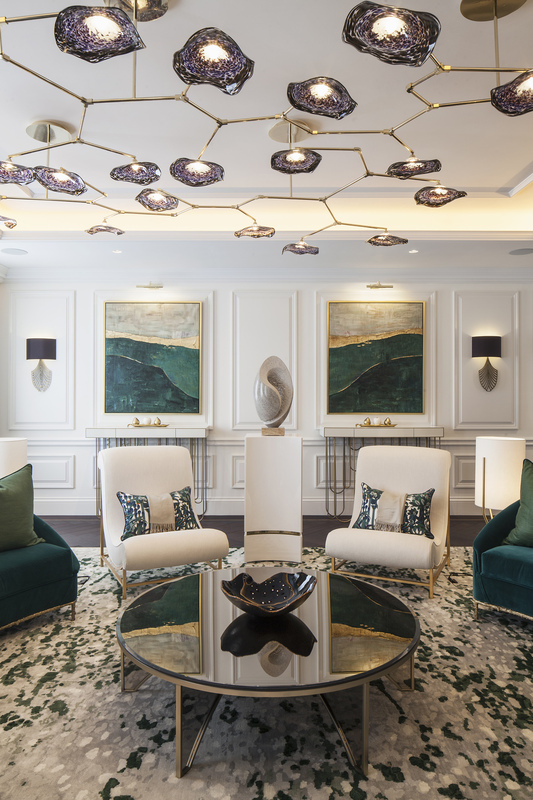 We interviewed Celine Gehamy and Ollie Yates, Product Creation at Nulty Bespoke about their collaboration with Desariot Ademaj, the Creative Director at Fenton Whelan Design to produce bespoke lighting solutions for a project of this luxurious magnitude! 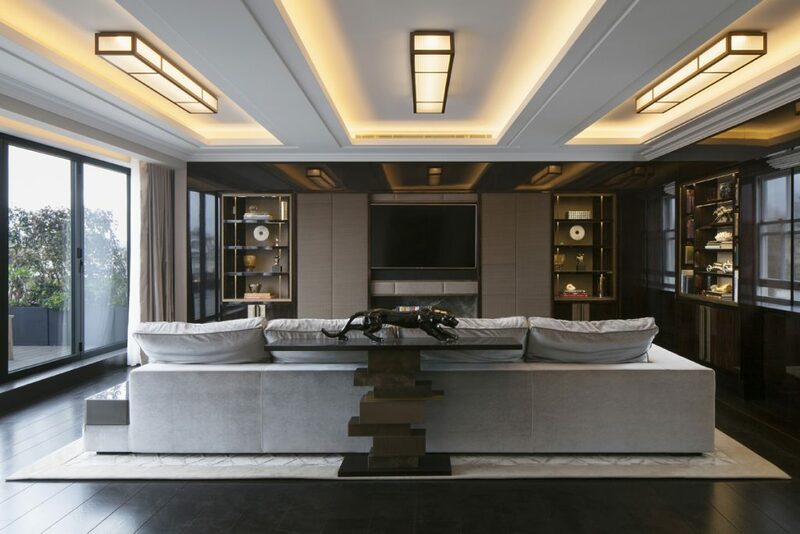 The client requested a selection of unique and individual luminaires designed for a luxury residential apartment in London. 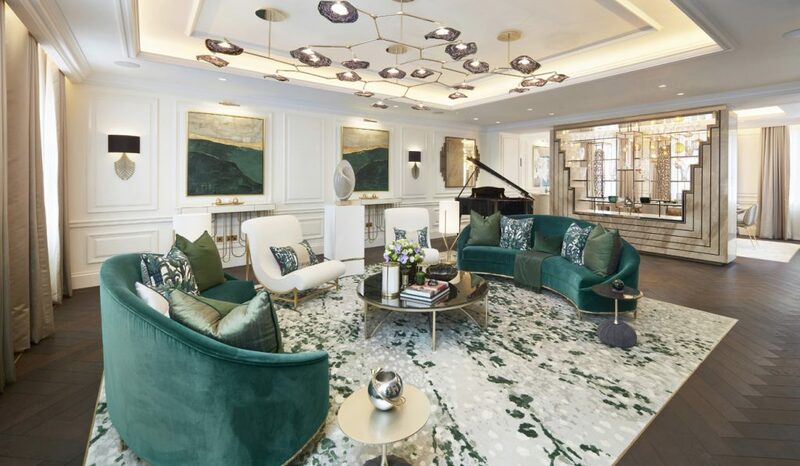 There were a number of spaces that we had to create bespoke pieces for ranging from the living room, dining room, entertainment space, stairwell and bedroom. The project was very high end and the design of the pendants had to reflect this, whilst supporting the individual style of each room. Each space required its own identity, and this is reflected in the design of the luminaires. Such as the finishes, the shape, light source and colour temperature. A light sculpture in the main entertaining space of the apartment, incorporates 22 mouth-blown dish-like glass shades made in London. Each shade is a combination of different hues of purple and white. The sculpture consists of two separate polished champagne-gold-coloured metal frames, which seamlessly blend together as one. Each section has two ceiling plates incorporating the same metal. The LED light source is housed in an oval-shaped detail accommodating the natural, variations of glass thickness. The underside of the glass resembles an oyster shell with a pearl nestled within. Three large tailor-made Art Deco inspired luminaires add a stylish touch to the top floor entertaining space. The refined light fittings, each measuring 1.6m x 0.25m have been handcrafted with sandblasted reeded glass, a material reminiscent of the Art Deco era. Each luminaire exudes a diffused light, and a warm temperature of 2400k providing a soft radiant effect within the ceiling cove. The trio of elegant handmade luminaires brings a sense of perspective to the room and demonstrates that simplicity can most definitely be striking. The quality of the luminaires complements the rich materials used in the interior design, adding a classic touch to the gentleman’s club-feel of the room. 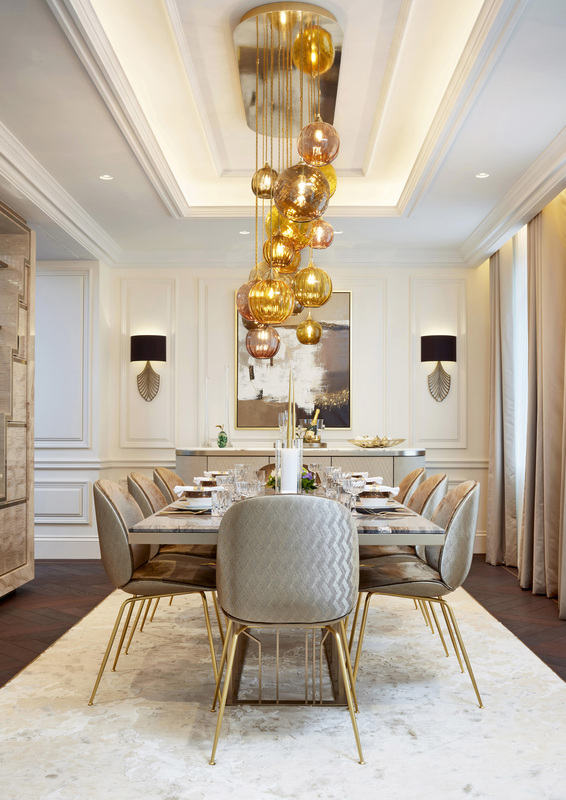 A statement cluster of 19 hand-blown glass shades made in England hang above the dining table, complementing the sense of drama in this opulent space. Dimmable filament bulbs, produce a warm colour and the shades have a variety of finishes (diamonds, ribbed, smooth) and colours (amber, grey, purple and light brown). A handcrafted seven-metre chandelier is suspended from a precision engineered, polished nickel structure positioned directly below the elliptical skylight within the stairwell. The frame is purposely simple and open in a design to make sure the flow of natural light is not restricted. 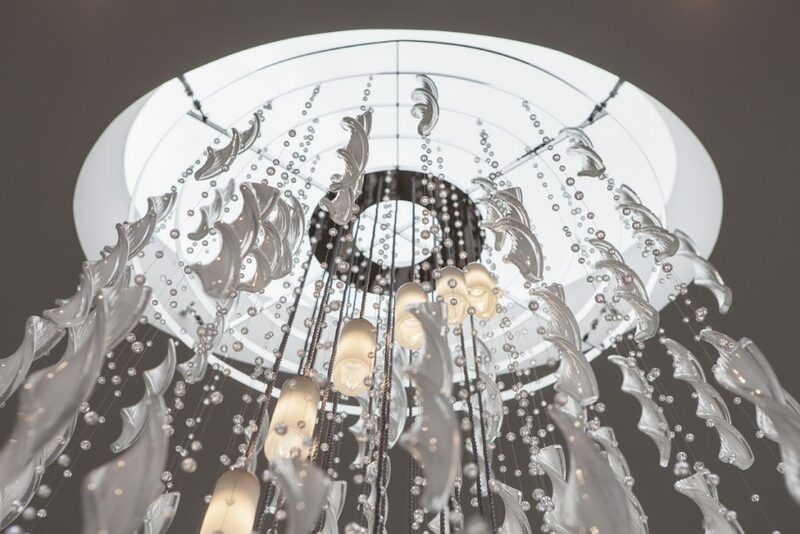 The impressive lighting installation resembles a waterfall and comprises over 100 handmade Italian glass twists and 1500 faceted crystal spheres. 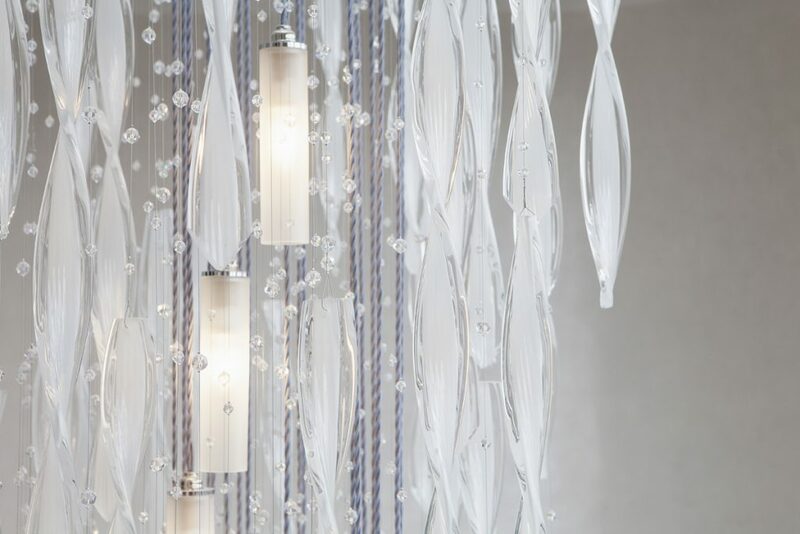 The glass twists have a rippled texture, an opaque centre and a pointed tip for added definition, and they complement the crystal droplets beautifully. Cascading through the centre is a spiral of 22 frosted glass lanterns housing LED lamps, which provide a soft, warm glow of light to the space, while highlighting the sculpture’s intricate glass work and sparkling crystals. Adapting to the construction constraints on site proved tricky at times but we managed to work closely with the client to provide quick and efficient solutions to deliver the project on time and to a high standard. A highlight of the project for us lies within the attention to detail of each piece. Each luminaire was a labour of love from the initial design sketches to the final installation on site. To see our creations come to life and fit within each room perfectly brings a great sense of satisfaction as designers. If you missed last week’s Project of the Week featuring an extravagant mansion in the gated ‘Karma’ compound overlooking the luxurious quarter in Cairo, click here to see more.